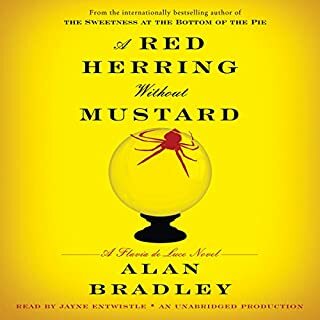 In his wickedly brilliant first novel, Debut Dagger Award winner Alan Bradley introduces one of the most singular and engaging heroines in recent fiction: 11-year-old Flavia de Luce, an aspiring chemist with a passion for poison. To Flavia the investigation is the stuff of science: full of possibilities, contradictions, and connections. Soon her father, a man raising his three daughters alone, is seized, accused of murder. And in a police cell, during a violent thunderstorm, Colonel de Luce tells his daughter an astounding story, that of a schoolboy friendship turned ugly, of a priceless object that vanished in a bizarre and brazen act of thievery, of a Latin teacher who flung himself to his death from the school's tower 30 years before. 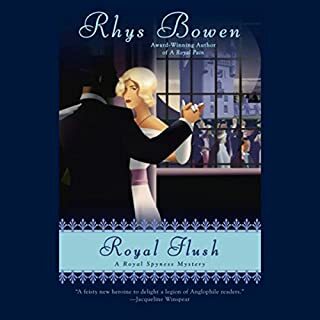 Now Flavia is armed with more than enough knowledge to tie two distant deaths together, to examine new suspects, and begin a search that will lead her all the way to the King of England himself. Of this much the girl is sure: her father is innocent of murder, but protecting her and her sisters from something even worse. 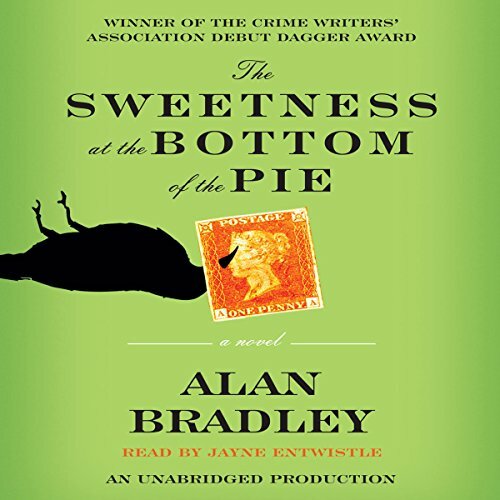 An enthralling mystery, a piercing depiction of class and society, The Sweetness at the Bottom of the Pie is a masterfully told tale of deceptions and a rich literary delight. Around half the book, I felt like just letting it go. I thought it was full of useless details and I could not see where it was going. I had already decided I would never read the second book in the series. But the narrator was very good, and at some point I realized the author was Canadian! I could not let the book go once I knew this. The second half of the book was much better (for me). I started getting into it as I tried to remind myself of what it felt like, being an eleven year-old and reading mystery books. Then I started liking Flavia quite a bit. Now I think I just might, some day, read the second book! Wonderful, tight writing and a delicious reading by Jayne Entwistle. She perfectly embodies the gleeful precociousness of 11-year-old Flavia. Bradley provides wonderful dialogue and observation while keeping the plot taut and moving. An absolute pleasure to listen to. A treasure of a series! A surprising treasure! I’m a new fan of Flavia de Luce- a modern, very smart girl sleuth in the same genre of Trixie Belden and Nancy Drew! 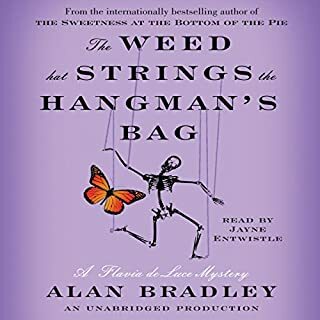 To say that Jane Entwhistle read this audiobook and did it justice would be a grave understatement - this book absolutely leapt to life for me in her amazing reading. 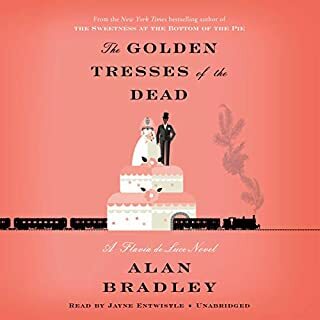 At its core, there is a mystery afoot in the life of Flavia, a young girl in a rambling estate in the UK of the 1950's, and though certainly the arrival of a corpse in the cucumber patch would be enough to send a weaker soul to faint, Flavia is not that soul. Flavia is hands down my favorite character of 2009 to date; she has a strong mind, a true love of chemistry, and a special fondness for poisons. Her mind is a joy to step inside, and her realization that her father might go down for the murder of the man in the cucumber patch is enough to put her considerable gumption and knowledge to the task of proving him innocent. 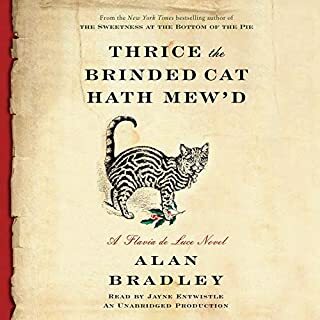 Alan Bradley has spun a delightful and completely engrossing tale here, and I look forward to more. I bought this just yesterday looking for something light and fun to listen to and I was not disappointed. 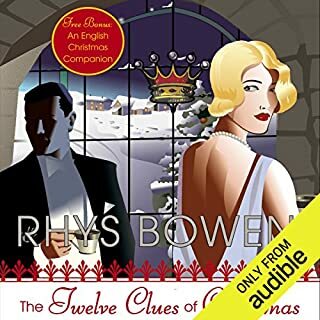 My only hesitation had been that the eleven year old heroine might be a bit childish, but I was very surprised to discover that I liked the intelligent tomboyish Flavia immensely. She is a precocious, mischievous little Sherlock Holmes who never once lost my attention. The stodgy English backdrop to this little mystery is full of wonderful characters that flesh out the scene and give life to Flavia's world. 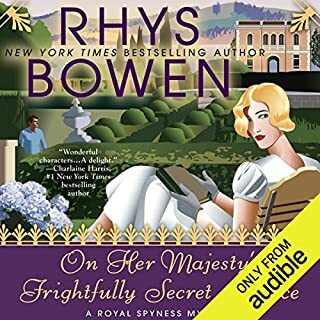 The mystery is reminiscent of a Holmes scenario and it too had me itching to get back to the audio book as soon as I woke up this morning. 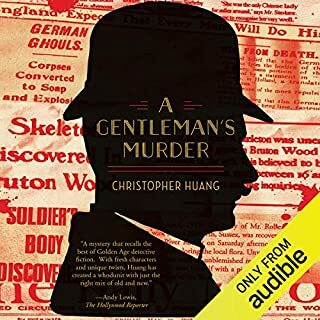 It's a very intelligent story full of interesting chemistry tid-bits and historical references that made me feel as if I'd found a delightful juvenile detective series on BBC to lose myself in for a bit. And I found the narration to be superb! I listened to the sample as a few reviews suggested and never once found Entwistle to disappoint. Im downloading the second book now without hesitation! 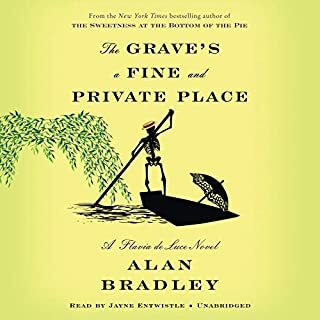 A nicely written mystery with all the classic elements: an English estate, an argument late at night, a dead body in the garden, a murder investigation. In the hands of a lesser writer, these elements could signify a contrived, cookie-cutter mystery. This is far from it. 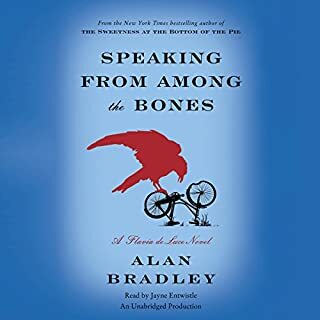 It follows some basic patterns expected in a mystery, but delivered in the first person narrative by a completely likeable, precocious eleven year old, it turns into a very engaging, suspenseful, funny and entertaining story. 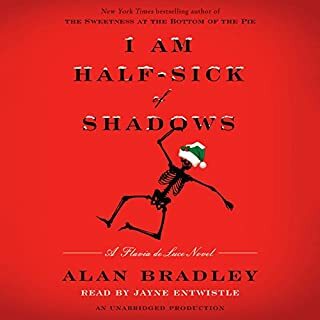 I loved Jayne Entwhistle's reading, her voice and inflections perfectly capture what one might expect of an eleven year old telling her tale and really brings this story to life. This was so thoroughly enjoyable that I will probably let it sit in my ipod for awhile longer so I may listen to it again later. I really enjoyed this book (if you couldn't tell from my title). I probably would have given it a 4.5 if it had been possible because the mystery wasn't super tight, but leaned to the 5. It was well narrated. Many have complained about this, but I think each voice is perfectly done. The heroin is a 9 year old precocious aristocrat. It may be that those who found the voice annoying really would find the heroin annoying if they were to meet her in real life. If that is the case you probably shouldn't be listen to this series. On the contrary I found that they nature of the characters and their world was the most intriguing part of the story. Flavia behaves as a precocious 9 year old would. Her area of interest just happens to be chemistry. In the world of high mindedness and proper English living it would not be that unusual. The mystery is done very much in the vein of Sherlock Holmes where details are everything and the pieces slowly start to fall into place by the end of the story. Again, the mystery does not have the tight reveal of some books, but is well done none the less. 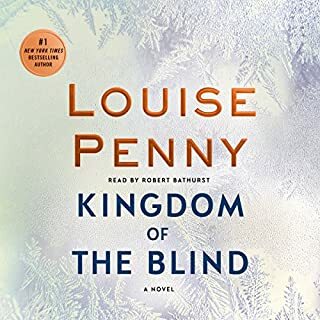 Over all I would highly recommend the book for the character development, its fun flair, the narration, and the way the story transports you to the period in which it is written. At 63, it's hard for me to adequately justify why I found this entire series about an 11 year-old sleuth so appealing. Young Flavia seems to think like an adult. But if you think back to the time you were a child, I'm sure you will remember how much you hated grown-ups acting like you were a piece of furniture, with no independent thought. I knew at age 3 that I hated broccoli - nothing has changed in 6 decades! Author Alan Bradley's depiction is spot on. The humor is tongue in cheek and often a real belly buster. This is also the very rare pairing of a great book with the perfect narrator. If Jayne Ebtwistle is ever replaced, this series will lose 50% of its appeal. 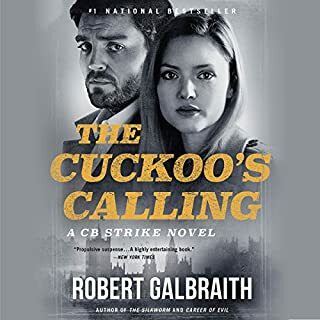 I've read the entire series, just finishing the most recently released book which ended with a mind-blowing clift-hanger. I can't wait for book 6. I'll have another piece of that pie please! Seriously, this is the most delightful surprise. I wasn't expecting that much and in fact, put off listening until a few days ago and now I cannot bear for it to end. Jayne Entwistle is absolutely brilliant in her portrayal of Flavia and I am savoring every morsel of this debut novel. Looking forward to the next one in the series and praying that the author gives us lots more of Flavia. In choosing this book I broke my own two important rules. #1- Read ALL the reviews #2 LISTEN to the sample. The reviewer who said the narrator was annoying was so right. Unfortunately I read a few of the positive comments and clicked "buy". I disliked the narrator from the first chapter and could not get through even 2 hours before quitting. I understand that she is trying to sound like a young girl and it really misses the mark. To me, the narrator makes Flavia sound like a brat. I'm glad this book has such a great following, for it is clever and amusing, but do listen before you buy. I don't even want to read the print version now as I would "hear" that voice. Flavia is ruined for me. And only myself to blame. What a heroine! What a book! To think that a man can create a smart-as-a-whip, chemistry-genius 11-year old girl who lives in an English manor home in a charming British hamlet is nothing short of astounding! 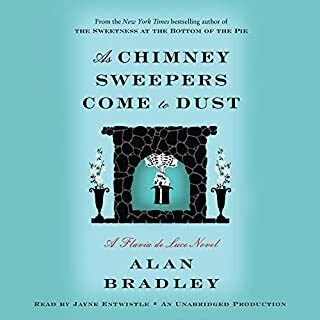 Alan Bradley has conjured up the most adorable, charming, engaging and humorous character to grace the pages of books in a very long time. Bradley has a gift - an amazing gift at that. 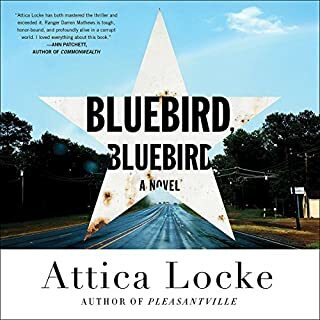 He has given Flavia de Luce every quality and characteristic to make her nothing less than completely enchanting and memorable. Having noted this, Flavia also plays tricks on her very nasty sisters (I would also given these two as siblings), has a tendency to create lies when it suits her purpose, and - of course - is a brilliant detective. All this in one character whom I have grown to love, cherish and respect. If I had had a child, I would have wanted one just like Flavia. The reader of this book is magnificent. 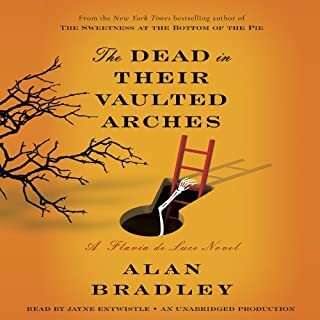 She doesn't have an annoying little girl voice that could drive a listener to distraction, but makes Flavia nearly jump off the pages into your lap, her skills are so adept at reading Bradley's words. Of course, her fabulous English accent helps a good deal! I seriously think Mr. Bradley is worthy of an OBE, so we can call him Sir Alan. What a masterpiece! I'm reading one book in hard copy and listening to two other Flavia novels. I can't get enough of her, her family, village and Gladys, her trusty bicycle. I'd love to sit down with the author one day and understand how Flavia came to him and where he learned to write in such a masterful way. 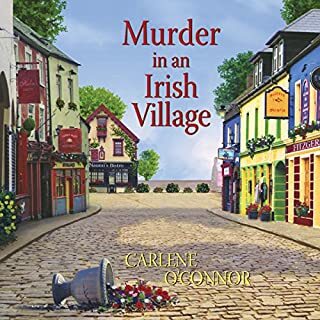 Read every book, if you want to fall in love with cozy mystery at its finest. This is the first one and what a rocket-launcher it is! This book was excellent -- the heroine, Flavia, is a delightful girl fascinated by chemistry. 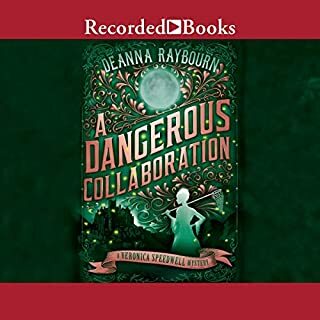 I loved the narration -- I thought it fit the main character very well. It was a mystery that was easy to follow. An excellent book to listen to. If you could sum up The Sweetness at the Bottom of the Pie in three words, what would they be? The heroine is an eleven year old chemistry genius who is a fine detective. The stories are excellent and the humour and tension are, in equal parts, superb. The plots are well crafted and believable, even though the heroine is young. I can't pick one scene as a favourite as the whole book is wonderful in so many different ways. The author has a gift for writing a credible and edge of seat gripping yarn and enable us to put ourselves in the place of his heroine.